The list that follows is a simple overview that refers back to the inventories and reproductions present in other areas of the website. Library, 19th-20th c., 459 pieces: the library consists of manuscripts and printed books. For inventories and reproductions, see Online materials—Manuscripts and Online materials—Printed books. Music collection, 331 pieces: for inventories and reproductions of materials in the Bibliotheca musicalis, see Online materials—Bibliotheca musicalis. Diplomatic collection, 271 pieces: the diplomatic collection consists of parchment rolls from 1208 to 1954. 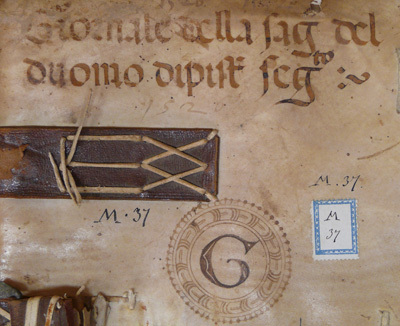 For reproductions (sometimes accompanied by an edition of the text) and for inventories, see Online materials—Parchments. This census is taken from: Gli archivi storici ecclesiastici delle Diocesi di Pistoia e Pescia, a cura di Rita Laura Aiazzi, Lucia Cecchi e Nadia Pardini, Pistoia 2000, 11-14.